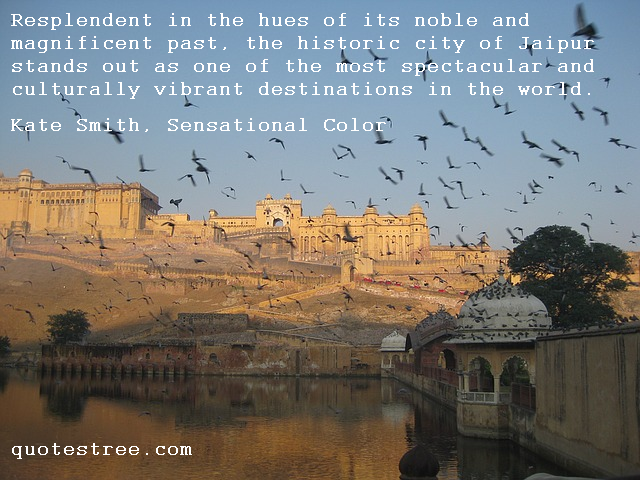 Known as Pink City, Jaipur is the capital and largest city of Indian state of Rajasthan. The city, founded in early 18th century , is named after Maharaja Sawai Jai Singh II of Amber. Four hours later, they reached the rocky hills surrounding the Pink City, passing in the shadow of the Amber Fort with its soaring ramparts and towering gatehouse. The road led past the Jal Mahal palace, beached on a sandy lake bed, into Jaipur’s ancient quarter. It was almost noon and the bazaars along the city’s crenellated walls were stirring into life. Beneath faded, dusty awnings, cobblers crouched, sewing sequins and gold thread onto leather slippers with curled-up toes. Spice merchants sat surrounded by heaps of lal mirch, haldi and ground jeera, their colours as clean and sharp as new watercolor paints. Sweets sellers lit the gas under blackened woks of oil and prepared sticky jalebis. Lassi vendors chipped away at great blocks of ice delivered by camel cart. In front of a few of the shops, small boys, who by law should have been at school, swept the pavements, sprinkling them with water to keep down the dust. One dragged a doormat into the road where the wheels of passing vehicles ran over it, doing the job of carpet beaters. Handbrake honked his way through the light traffic as they neared the Ajmeri Gate, watching the faces that passed by his window: skinny bicycle rickshaw drivers, straining against the weight of fat aunties; wild-eyed Rajasthani men with long handlebar moustaches and sun-baked faces almost as bright as their turbans; sinewy peasant women wearing gold nose rings and red glass bangles on their arms; a couple of pink-faced goras straining under their backpacks; a naked sadhu, his body half covered in ash like a caveman. Handbrake turned into the old British Civil Lines, where the roads were wide and straight and the houses and gardens were set well apart.